Three of the highest capacity lifts America has ever seen continue to take shape this spring at Walt Disney World in preparation for a 2019 opening. With steel coming together for the first two megastations announced almost a year ago, the Hollywood Studios gondola seems on track to be completed first. To keep things consistent, I’ll start this month’s update at Epcot, where the longest of three Disney World lifts will terminate. 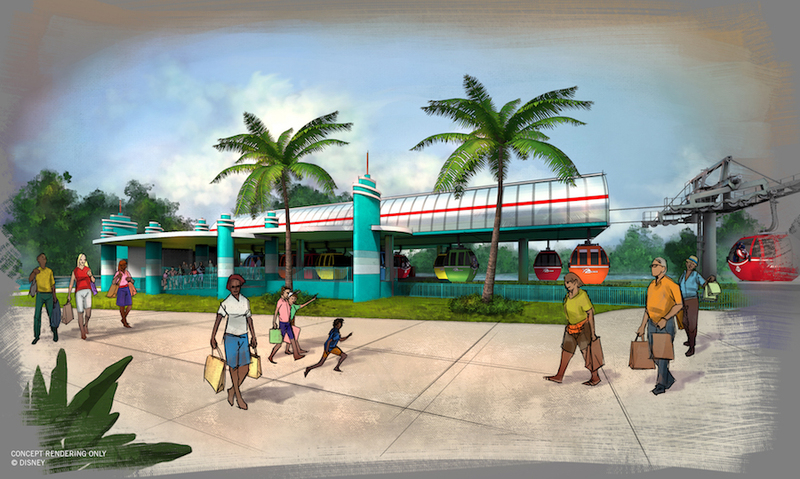 This zigzagging line will feature two intermediate stations between Epcot’s International Gateway and the south end of the Caribbean Beach Resort. Foundation work is in progress at all four stations and the second to last tower (number 25 I think) was recently set near the park entrance. You can see in the bottom left of the above photo that it might be finished in a green shade to blend into its surroundings. More towers are either standing or soon will be between Epcot and the first turn station near the parking lot for Disney’s BoardWalk Inn. This section appears to have around seven towers total. The ride will be very cool with one water crossing, a forest section and Eiffel Tower views. Doppelmayr’s next-generation detachable lift technology appears headed for North America. 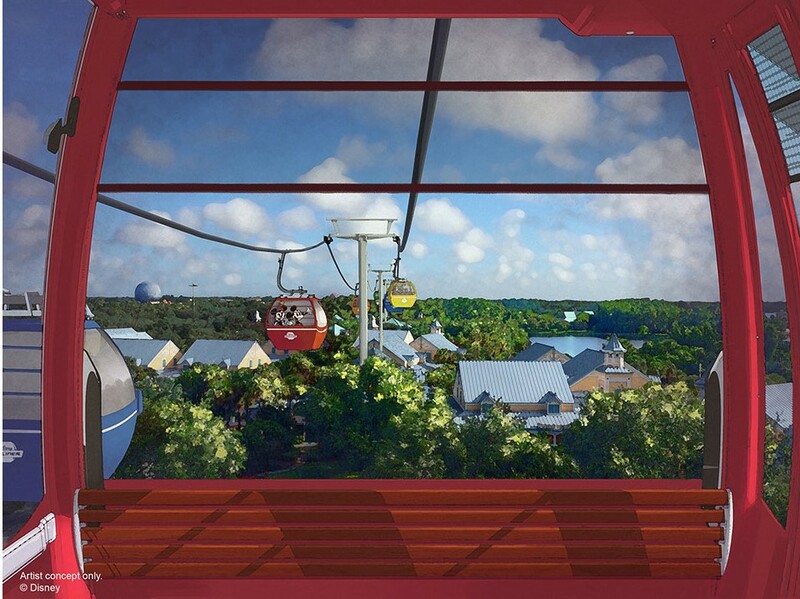 Walt Disney World Resort released new details about the upcoming Disney Skyliner gondola system this morning and renderings appear to show D-Line Station-D enclosures. 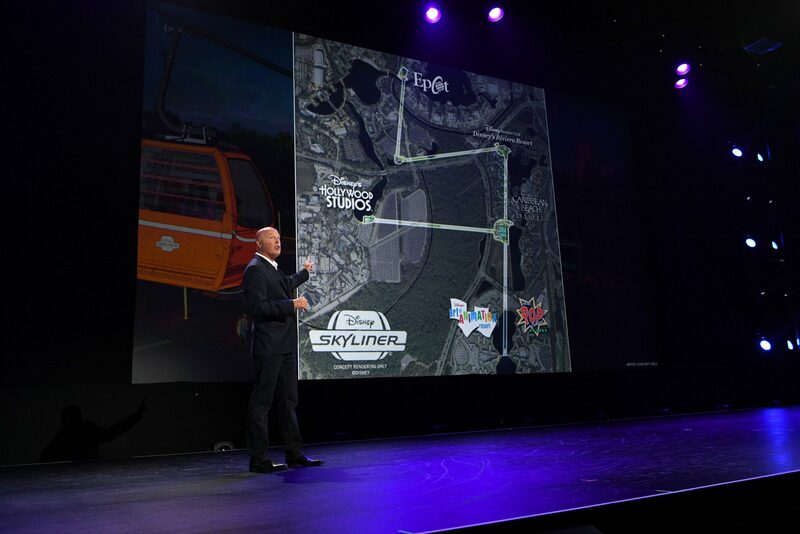 Each of the six gondola stations will be themed differently, reflecting unique character of the destinations they serve. D-Line is Doppelmayr’s latest detachable product that debuted two years ago in Hochgurgl, Austria. Numerous D-Line lifts have since opened in the Alps but no American resort operator has opted to pay extra for one so far, opting instead for the proven UNI-G terminals and standard line equipment. The Walt Disney Company isn’t your standard lift customer, however. D-Line sports hundreds of innovations including rope speeds up to 7 m/s or 1,378 feet per minute and wider line gauge for wider carriers. CWA has developed D-Line-specific Omega gondola cabins with 11 percent greater seating area than non-D 10-passenger versions. At Disney World, cabins will sport custom wraps with the Disney characters guests know and love. With The Beavers expansion, Arapahoe Basin ditches painted trail map for a VistaMap. The BBC produces a fantastic 23-minute podcast explaining the success of Mexicable, the newest urban gondola built by Leitner Ropeways. You can watch Belleayre’s gondola take shape live on their webcam. More recent photos are here. The New York State Fair’s Broadway Skyliner appears to be a relocated Stadeli. I’m thinking it’s Bucksaw from Sugarloaf. SNOW Operating to take over operations at Mountain Creek. To compensate for a late July gondola opening, Steamboat extends “summer” season until late October. Bob Wheaton says being part of a larger resort group will allow Deer Valley to negotiate better prices on lifts. Lift operator and friends sentenced to probation and ordered to pay $96,000 in restitution for stealing and selling $116,000 in lift downtime vouchers from top shacks at Heavenly and Northstar. Vail Resorts has since changed the way it handles the vouchers companywide. MND Group secures $6.7 million private investment to support future growth. Whitewater’s new Leitner-Poma quad chair project update. Sunday River blasts some rock to make way for Spruce Peak 2.0. Timberline Helicopters, the company that flies the majority of lift towers in the West, plans to build a new $3 million home on 93 acres in Northern Idaho. SeaWorld San Diego commemorates 50 years of operation of its VonRoll Skyride, one of only 11 remaining in the U.S.
Tragedy in Gulmarg, India as seven die following tree strike on the world’s second highest gondola. The accident was blamed on an ‘act of god’ and the gondola deemed mechanically fine. More trees will be cut before reopening. Human error caused 14-year old girl’s fall from a chairlift at Six Flags Great Escape. After video gets millions of views, editorial in the local paper calls for locking restraint bars. Colorado tram board votes against disciplinary action in Granby Ranch case. 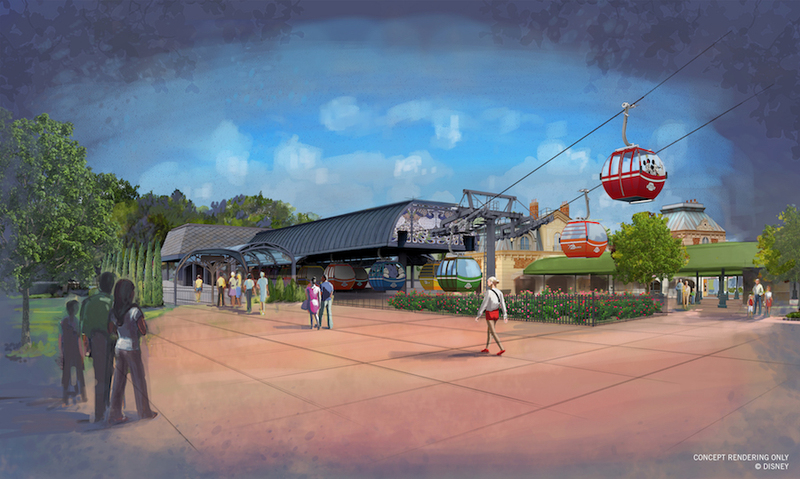 A Walt Disney World gondola update. Much-maligned New York State Fair gondola project is dead. Anakeesta load tests new Chondola. Watch LST Ropeways build its first detachable lift in three minutes. A Swedish company has developed a new, more comfortable T-Bar carrier called Boardie. Doppelmayr moves into new $62 million Wolfurt headquarters. Grand Targhee, Jackson Hole, Brundage, Sun Valley, Mt. Hood Meadows and Tamarack are operating a total of 13 lifts on August 21st for the first total solar eclipse visible from the United States since 1979. Vail and Replay Resorts break ground on LIFT development set to anchor future detachable Sunrise lift at Park City’s Canyons Village. Preliminary gondola tree cutting and construction work spotted at Walt Disney World. Waterville Valley secures $7.5 million for future projects including multiple unspecified lift upgrades. “To answer one burning question, we do have multiple options in development regarding the High Country lift,” the resort says on Facebook. Utah sets another all-time record for skier visits. Two new Skytracs in St. Maarten won’t open until late summer but are already getting rave reviews. Foundation work is starting for Disney gondolas. Partek will build a fixed-grip quad at Mt. Peter, NY this summer. East River Skyway proposal expanded to five phases with more possible stations. Belleayre bid documents suggest December 2017 completion and a name for gondola: Catskill Thunder. Funding was approved Monday though I’m told a manufacturer has not yet been awarded the contract. NY State Fair gondola is also funded, separate from a chairlift to be built there by SkyTrans Manufacturing this summer. Lee Canyon seeks approval to build two new quad chairs in new places. Work to resume on Poma gondola in Zacatecas, Mexico with commissioning scheduled for September. Gould Academy may build a T-Bar up Monday Mourning at Sunday River. Intrawest stock hits record high amid acquisition rumblings. A Yan detachable still operates with original grips in Spain. Quebec announces $70 million in subsidies to support infrastructure investments at ski resorts in the province, including lift upgrades. SEC filing shows exactly how much CNL Lifestyle Properties paid for each of the 16 ski resorts it owns. The most valuable was Northstar at $80.1 million with Loon Mountain selling for just $15.5 million. The Gatlinburg Sky Lift operation went for a whopping $19.9 million! Bridger Bowl to sell chairs from Virginia City if buyer falls through. Interalpin, the every-other-year mountain technology nerd fest is April 26-28. If rent payments to the federal government are any indication, Colorado is booming. Flying demo tent gets hung up on Stowe gondola. Staff at Barcelona’s urban gondola will strike. 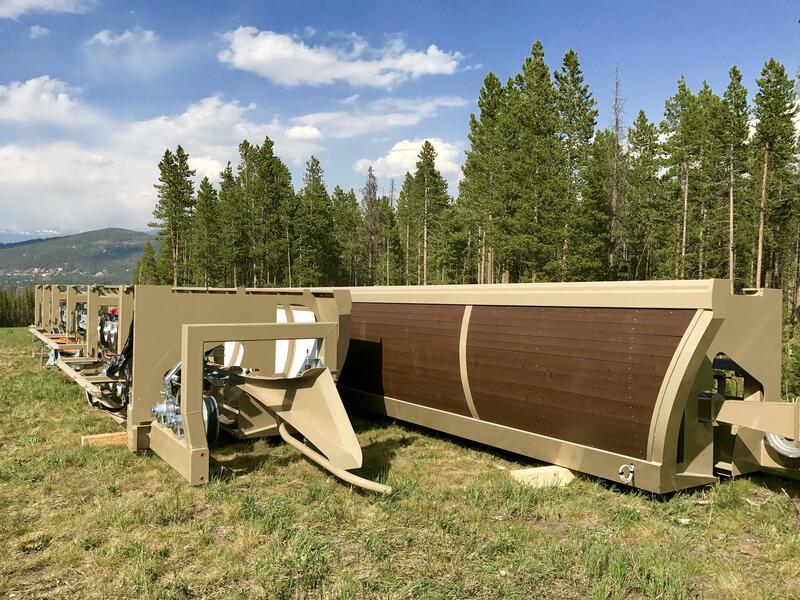 In addition to completing the Green Lift, Magic Mountain will install a new motor and drive for the Black Lift and return capacity to three per chair. Lift Blog reaches 1,000 Instagram followers, 700 Facebook fans and 1,000,000 page views. Thank you to everyone who has supported me with this project over the last two years.